Image via AFP via Sydney Morning Herald. 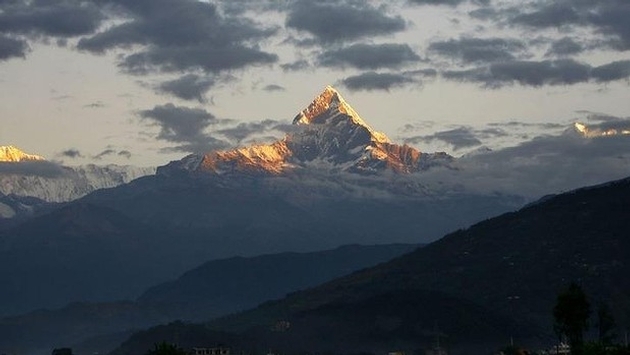 Tragedy struck Nepal’s Himalayas on Tuesday as 17 people have reportedly died amid what is being called a major storm and avalanche. The Sydney Morning Herald reports the effects of a powerful Cyclone Hudhud claimed the lives of “nine foreigners and eight Nepalis” while 100 more were said to be out of contact—although 22 hikers have been found at this time according to the report. On Tuesday, inclement weather wreaked havoc along the range, causing incidents outside the avalanche, which rescuers are trying to remedy. And then there is the case of a 67-year-old French hiker who went missing after falling into a nearby river along the Manaslu route. The Wall Street Journal’s Krishna Pokharel puts the number of deceased at least 13 during Tuesday’s storm; also stating the weather brought with it a wallop of four feet of snow. General secretary of Himalayan Rescue Association, Basant Hamal, spoke with Pokharel who relays somewhat conflicting numbers. According to Hamal, 18 people have been rescued, while many others are cut off after the storm, giving a total of about 70 to 80 hikers who were originally set to cross the Thorong La pass. Both reports remind that 2014 also saw 16 people lose their lives during an avalanche on Mount Everest in April.